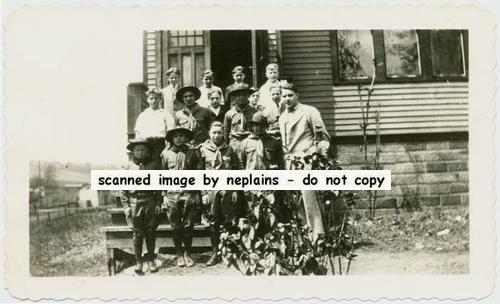 Early photograph of 14 boys and a man standing on the steps near a school building or large house. Several of the boys are wearing their full Boy Scout uniforms with hats. "1929" handwritten on backside. Snapshot photo measures 4-1/2 x 2-3/4 inches, with scalloped edge. Photo clean with nice detail. Very shallow creasing near the corners. Shallow album page residue adhered to about 80% of backside.